Black violet color. Elegant aromas and flavors of raspberry-dark chocolate truffle, allspice leaf, sundried tomato, and graphite with a chewy, vibrant, dry-yet-fruity full body and a smooth, distinctive, long finish evoking overtones of grated cinnamon, cola, tart cherry pie, and cucumber. An inky, concentrated malbec that delights the senses; a lovely cellar candidate. Bottom Line: An inky, concentrated malbec that delights the senses; a lovely cellar candidate. 93 • Encendido 2014 Single Vineyard Barrel Fermented, Cabernet Franc, Uco Valley 15% (Argentina) $65.00. 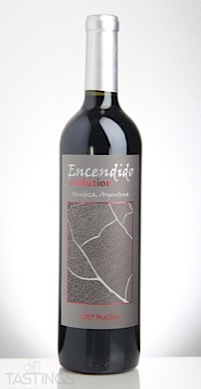 92 • Encendido 2015 Evolution Single Vineyard, Malbec, Uco Valley 14.4% (Argentina) $30.00. 84 • Encendido 2017 Single Vineyard Rosé, Uco Valley 15% (Argentina) $24.00. 90 • Encendido 2014 Single Vineyard Barrel Fermented, Malbec, Uco Valley 15% (Argentina) $65.00. Encendido 2015 Evolution Single Vineyard, Malbec, Uco Valley rating was calculated by tastings.com to be 92 points out of 100 on 2/8/2018. Please note that MSRP may have changed since the date of our review.